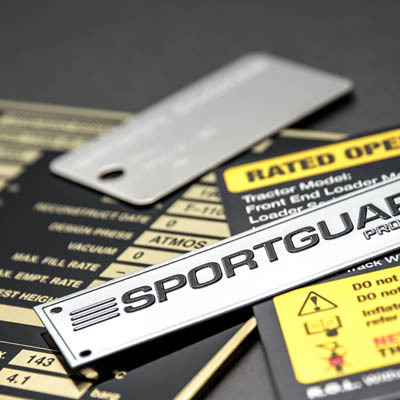 Superior durability, attractive finish and resistant to harsh conditions, metal nameplates are the right choice for applications that require important information such as company branding, loadings, ratings and safety information to be clearly communicated, and remain legible for many years. 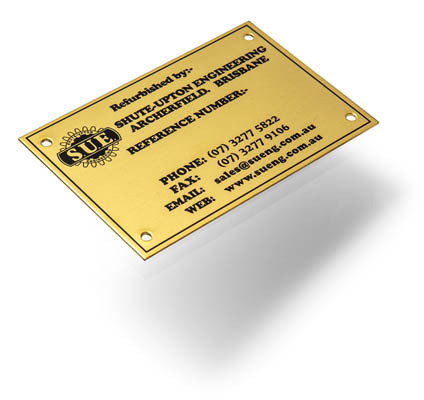 Aluminium, Stainless Steel and Brass are the most commonly used substrates, Information can be etched into the surface of these metals as well as surface printed or engraved. There are several options for mounting, such as holes ready for rivets or screws, or adhesive backings – which are specified according to the material being adhered to. Permark offer many options – simply contact us and we will provide technical advice, free samples and a no obligation quote. 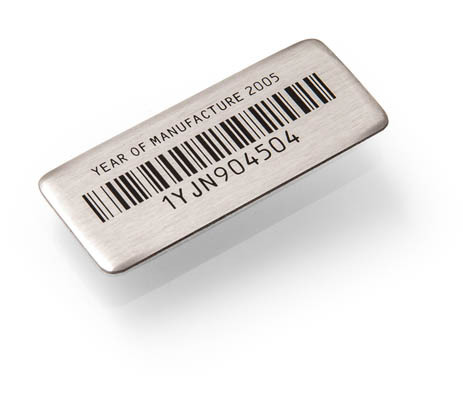 Many nameplates require unique or variable rating information to be printed onto the plates. This can be achieved by Screen or Digital printing, chemical etching, diamond scratch engraving or laser engraving. For sequential numbers, Permark stamps numbers onto the plates with a power press. Mounting holes ready for rivets or screws can be pressed in the plates, and/or specialty adhesive backing can be applied – which are selected to suit the material the plate will be adhered to. 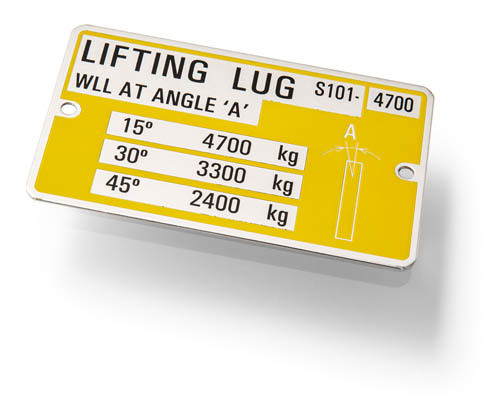 Anodised Aluminium is an ideal choice for permanent labeling where durability is important. 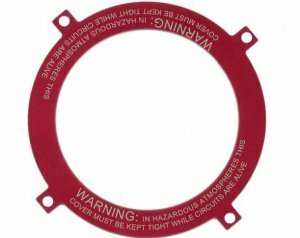 Suitable for use in tough environments, where resistance to high temperatures, wear and abrasion is required, or where plastic or paper labels would otherwise not withstand the conditions. 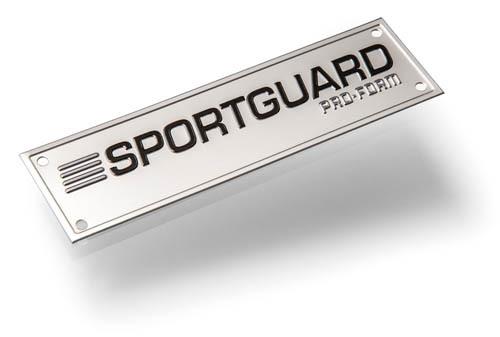 Nameplates are used to brand and identify equipment and convey information, such as operating instructions, loads, tolerances, limits, rating and safety information. Aluminium can be surface printed with inks, sub-surface printed using Screenprint or Digital PermaDize with dye after anodizing, and can be caustic etched and then paint filled. The most common method of decoration is to anodize and then print dye (see Anodising). Surface printing is employed in instances where colour is important and specific PMS colours are required, or where special inks are required, for example to withstand extreme temperature. Etching and Paint filling is employed either for decorative effect or in applications where the extra security of an etched image is needed. Permark offer a range of gauges from 0.2mm to 3mm in various grades. A choice is made on the thickness of material based on application. How will the plate be shaped? What other processes will be used that will affect material selection? Does the plate carry any load? How is the plate to be mounted? Depending on material selection, the plates can be cut out, pressed out, knifed to shape or laser cut. A large range of standard press tool shapes is available or we can manufacture press tools to suit specific custom designs. 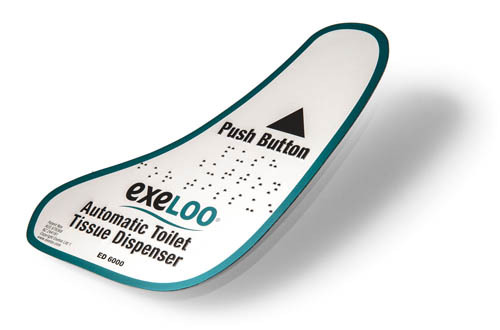 We also offer finishing Corner cropping and pressing of various size holes, embossing of text and symbols for decoration, or function such as Braille can be achieved. We can press holes into the metal plates for mounting with rivets or screws. Plates can also be mounted by welding to units at the point of manufacture. For ease of application, backing adhesives can be applied which are suitable for adhering to a range of substrates, such as metal, plastic and powder coated surfaces. Many of the adhesives are suitable for outdoor applications. The anodising process builds a film of aluminium oxide on the surface of the aluminium, after this a dye is either Screen or Digitally printed into the now porous layer. Once printing is completed, the pores are sealed, which traps the inks into the surface of the material. The sealing process changes the chemical composition of the aluminium, creating a hard mineral layer (Boehmite), which provides added protection from corrosion, and improves resistance to abrasion and wear. By combining the physical properties of anodized aluminium with specialist inks the resulting name plate image is colour fast, permanent and durable, and has the appearance of a clean, modern looking label. High quality look, superior durability, for harsh environments. Stainless Steel is an ideal choice of material for permanent labeling. It has a high resistance to corrosion, high resistance to temperature extremes, is resistant to most chemicals, is strong, easy to clean and athsetically pleasing. For the longest life image, Stainless Steel plates are decorated by chemical etching an image into the surface of the metal – typically 0.25mm in depth. This process leaves a legible image. The etching can then be colour filled with a two pot spray for decoration, (although this is not necessary for legibility). Mutiple colours can be used for decoration, and specific PMS colours for branding are able to be applied. Because the decoration fills in the etched portion of the material, rather than on the surface of the material, if is not susceptible to the same degree of surface abrasion, chipping or scratching that surface printed metal plates might be. Permark offer a range of gauges from 0.55mm to 3mm in various grades. A choice is made on the thickness of material based on application. Will the plate be exposed to seawater? Depending on material selection, the plates can be cut out, pressed out, or laser cut. 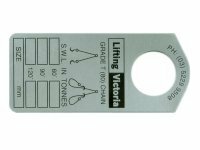 A large range of standard press tool shapes is available or we can manufacture press tools to suit specific custom designs. We also offer finishing such as corner cropping and pressing of various size holes. For ease of application, backing adhesives can be applied which are suitable for adhering to a range of substrates, such as metal, plastic and powder coated surfaces. Many of the adhesives are suitable for outdoor applications and will be specified to meet individual requirements. An Etched background highlights a bright eyecatching logo and black print on this pressed nameplate.